Nearly 100 homes in Euclid now have working smoke alarms, following one of the largest Fire Safety Walks ever held in Northeast Ohio. 283 smoke alarms were installed on Saturday, August 6, 2016, with the enthusiastic help of volunteers from Lincoln Electric and our partners at the Euclid Fire Department. “We were able to get into 95 homes and install 283 alarms. That is approximately 3 per home,” said John Gareis, Regional Manager of Preparedness and Community Planning in Northeast Ohio. As was the case last summer, Lincoln Electric CEO Chris Mapes worked alongside employees to install the smoke alarms, and to provide residents with valuable fire safety information. And Mike Parks, Regional CEO of the Red Cross in Northeast Ohio contributed to the effort, along with Red Cross volunteers and staff. 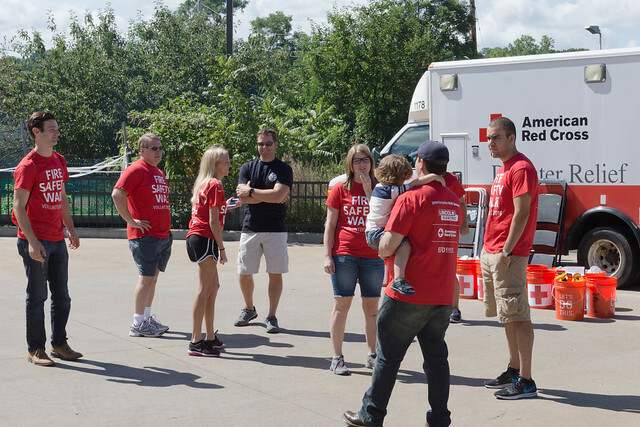 Last year, more than 100 lives across the country were saved after smoke alarms were installed by the Red Cross and our partners. Home fires remain the biggest disaster threat to individuals and families in the United States. There are three home fires, on average, in Northeast Ohio every night. Operation Save-A-Life, part of the national Red Cross Home Fire Campaign is in direct response to that dire threat, with the Red Cross committing to install 2.5 million free smoke alarms in neighborhoods at high risk for fires, and to educate those residents about fire prevention and preparedness. More than 12,500 smoke alarms were installed in homes in Northeast Ohio last year. If you would like a free fire safety inspection of your home, and free installation of smoke alarms, log onto redcross.org/neoosal. You can also visit redcross.org/homefires to find out more about how to protect you and your family from fire. You can also become a Red Cross volunteer. And you can help by donating to Red Cross Disaster Relief by visiting redcross.org, calling 1-800-RED CROSS or texting the word REDCROSS to 90999 to make a $10 donation. Donations to Disaster Relief will be used to prepare for, respond to and help people recover from disasters big and small. Click on the photo to see a gallery of pictures taken during the Euclid Fire Safety Walk. This entry was posted in Fire Safety Walk, Greater Cleveland chapter, Operation Save-a-Life, Partners, Smoke Alarms and tagged disaster preparedness, Fire Safety, home fires, Operation Save-a-Life, Preparedness, Smoke Alarms, Volunteers by American Red Cross of Northeast Ohio. Bookmark the permalink.